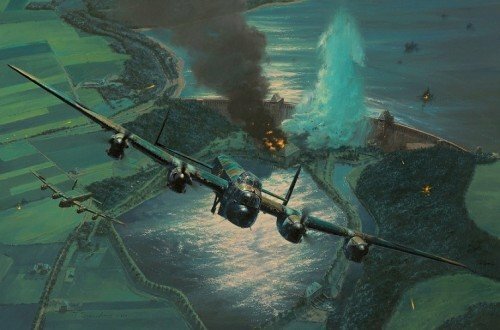 The Möhne Dam: 17 May 1943, 00.49 hrs - Guy Gibson engages enemy flak positions whilst Lancaster AJ-J, with pilot David Maltby at the controls, banks steeply away after delivering the coup-de-grace. A huge explosion and towering pillar of water marks the breach where a vast torrent begins to flood the valley below. The journey had been eventful, flying low they had crossed the Dutch coast and headed inland, skimming along canals and the countryside at tree-top height and meeting heavy flak at various points along the route. 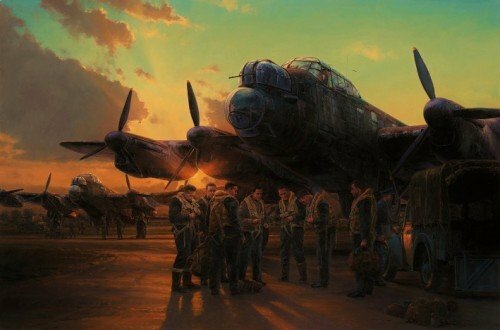 Yet now the first two waves of Lancasters had reached the Möhne Dam and, as the enemy flak opened up, the six aircraft began to circle their target. First Gibson in AJ-G attacked, his bomb exploding successfully, ‘Hoppy’ Hopgood crashed after being hit by gunfire, and then ‘Mick’ Martin in Lancaster AJ-P made his bomb run, yet despite being hit twice, the dam still held. Next Gibson called in ‘Dinghy’ Young in AJ-A, he too scored a direct hit but it seemed the dam was still un-breached. Things were looking bad as David Maltby in AJ-J made his run into the target but the top of the wall was starting to crumble. Young’s bouncing bomb had in fact cracked the dense granite wall and Maltby finished the job with a direct hit – the Möhne Dam was doomed. He served as Bomb Aimer on American Joe McCarthy’s Lancaster AJ-T, but as they were using a reserve aircraft, George did not have the benefit of the twin Aldis spotlights for accurate height keeping. So on their tenth pass George released his bomb, scoring a direct hit – but the earth dam survived the blast.